Silent-Dan Silent-DanOn some HUDs, for example rayshud, the fonts are sometimes cut off, for example the 2 in the health. Is there a fix for this? [quote=Silent-Dan][quote=Silent-Dan]On some HUDs, for example rayshud, the fonts are sometimes cut off, for example the 2 in the health. Is there a fix for this? Silent-DanOn some HUDs, for example rayshud, the fonts are sometimes cut off, for example the 2 in the health. Is there a fix for this? Increase or decrease the font size by 1 or 2 and try again like Rawsor suggested. Which colors do I have to edit in chatscheme.res to change the background color of the chat box? this post. I tried it on my PC and I don't have this issue. [url=http://ozfortress.com/showpost.php?p=995138&postcount=1482]this[/url] post. I tried it on my PC and I don't have this issue. STOGEDoes anybody know which HUD this is? Or the fonts used? [quote=STOGE]Does anybody know which HUD this is? Or the fonts used? RawrsorWhich colors do I have to edit in chatscheme.res to change the background color of the chat box? And I have absolutely no idea why this happens to him, but doesn't for me. He's using PVHUD with a scoreboard fix from this post. I tried it on my PC and I don't have this issue. There is a _minmode in that section which moves things up, he's not using cl_hud_minmode 1? There is a [i]_minmode[/i] in that section which moves things up, he's not using cl_hud_minmode 1? it's probably not white offwhite or dullwhite because it's transparent. Also, whenever I do showschemevisualizer of anything but clientscheme my game just crashes. Rawrsorit's probably not white offwhite or dullwhite because it's transparent. 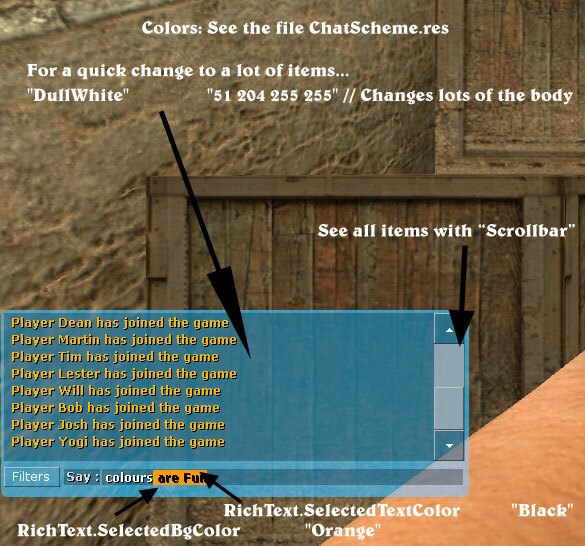 "DullWhite"	"42 142 242 255"
Also, whenever I do showschemevisualizer of anything but clientscheme my game just crashes. Rename custom or hud folder and try it without any custom files except resource/chatscheme and resource/ui/basechat.res being loaded? "inset" "0 0 0 0"
"color" "255 255 255 255"
this creates a border with a 1 pixel thick white border, but i would like its background to be black as well. is this possible without the use of custom materials? 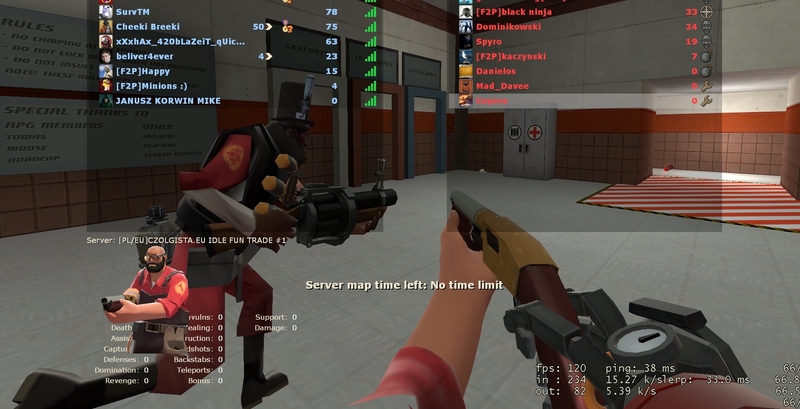 How do I add the player names above the health bars in spectate? I know they are present in the default HUD, and looking at the diff in the patch they were introduced is not helping me. SevinHow do I add the player names above the health bars in spectate? I know they are present in the default HUD, and looking at the diff in the patch they were introduced is not helping me. I think there is a font in your clientscheme.res that isn't there that is present in the default hud. I can't tell you what the exact one is at the moment. SevinHow do I add the player names above the health bars in spectate? Find/extract/download the default ClientScheme.res and find 'SpectatorVerySmall' that's the one responsible for the names above the players. I know they are present in the default HUD, and looking at the diff in the patch they were introduced is not helping me. You don't look at the diff of the patch they were introduced because they were added across multiple updates; you compare your clientscheme.res file to the default one to see what you're missing. Wiethoofd SevinHow do I add the player names above the health bars in spectate? Find/extract/download the default ClientScheme.res and find 'SpectatorVerySmall' that's the one responsible for the names above the players. I know they are present in the default HUD, and looking at the diff in the patch they were introduced is not helping me. You don't look at the diff of the patch they were introduced because they were added across multiple updates; you compare your clientscheme.res file to the default one to see what you're missing. I assumed the changes I was looking would have been in one of the spectator files, not clientscheme. Thanks. How would I remove the circle bit that points to where the intel is. Also, how would I shorten/remove the ctf bars? wtzHow would I remove the circle bit that points to where the intel is. Also, how would I shorten/remove the ctf bars? How would one make the damage that shows up in the HUD batched while the damage dealt above people's heads not be or have a smaller batching window? 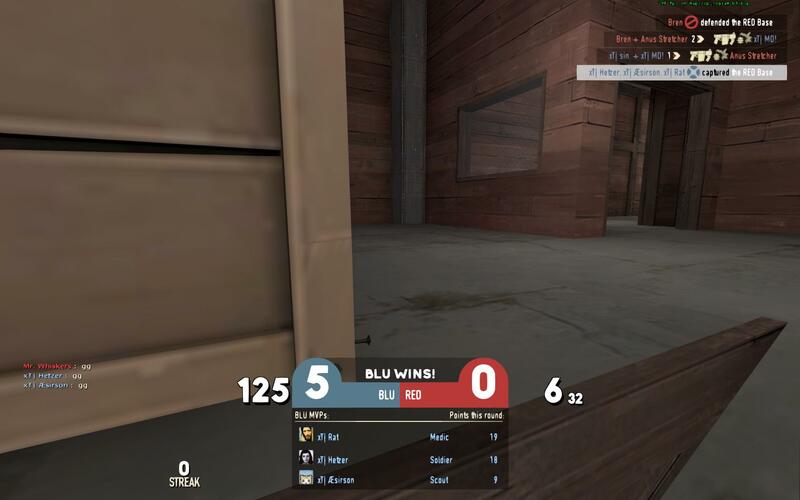 pyrotechnicHow would one make the damage that shows up in the HUD batched while the damage dealt above people's heads not be or have a smaller batching window? hud_combattext_batching_window "0.8" is what I use, hud_combattext_batching_window "0" will make it disappear or you could use hud_combattext_batching "0". 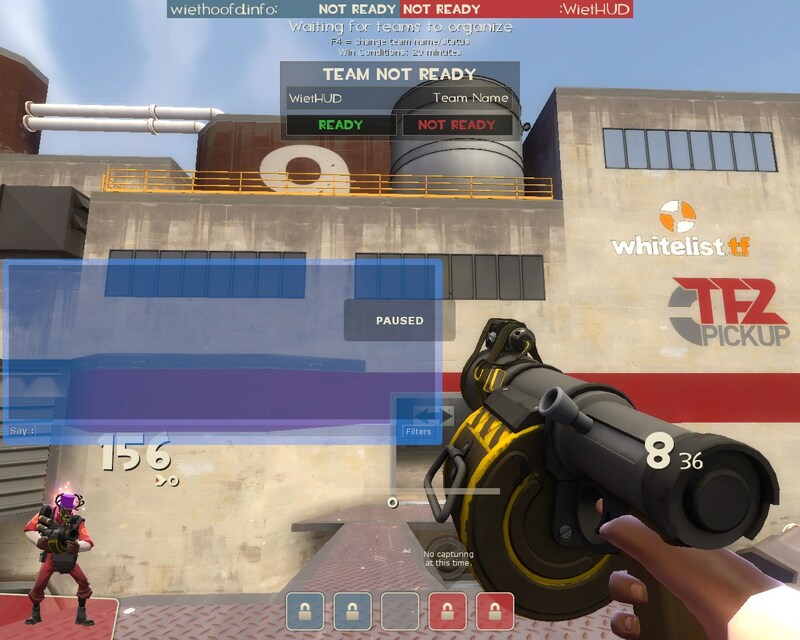 _Kermit pyrotechnicHow would one make the damage that shows up in the HUD batched while the damage dealt above people's heads not be or have a smaller batching window? I know how that all works. I don't think I was clear enough with my question. You know how a lot of HUDs show damage done somewhere near the health cross or the ammo numbers? 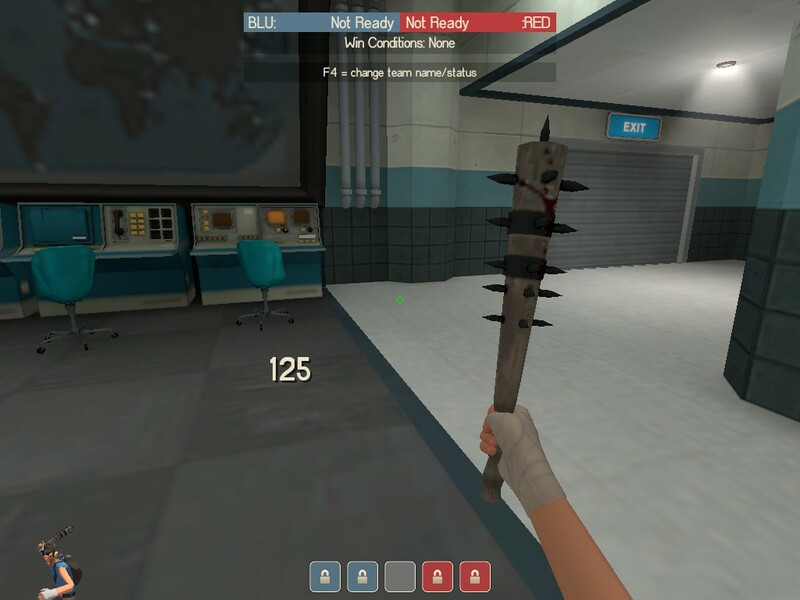 I was wondering if you can apply the hud_combattext_batching command to the damage text there instead of the damage text that appears above enemies heads. Impossible afaik, someone got lucky with the %ammo% to have it static in the hud, can't be the batched combattext value. Impossible afaik, someone got lucky with the [i]%ammo%[/i] to have it static in the hud, can't be the batched combattext value. Should be a simple color problem I assume, any idea? How do I add a "competitive" button to delihud? I want it to show the competitive menu, so when I eventually (hopefully) get a comp pass I can actually access the menu. Just use this version of delihud i made a few months ago. Smesi fnm. Just use this version of delihud i made a few months ago. Thanks! I updated the scoreboard as well, it appears it was a bit outdated. How can I remove the "Hold x to inspect your weapon" text? Where do you even edit the panels that appear when you die?